What is a Life Group @ inSpirit? A small group of diverse people who gather with the purpose of spiritual growth, personal growth, fellowship, and serving the community together. Gather: Most life groups at inSpirit meet twice a month. It is up to the group to decide when and where to meet. 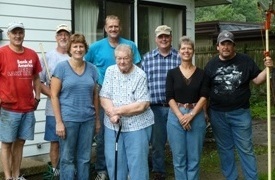 Grow: inSpirit has many varieties of life groups. Sermon based questions are available to use, or groups are free to use other study guides/books. Support and training are available. 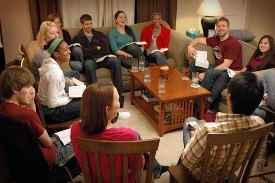 Go: Life Groups are encouraged to serve each other and the community. inSpirit has volunteer opportunities for helping those with needs within the inSpirit family and for service projects in the community. Why be involved in a Life Group? Act 2:42-47 talks about how the apostles devoted themselves to teaching, fellowship, prayer, and breaking bread together; in other words they lived life together and supported one another. This is the goal our Life Groups strive for. God is at work all around us, and wants to be at work in each of us. We want you to be involved in a group that will help you grow your spiritual faith and provide an environment that will allow you to be real with others, and loved and accepted for who you are. Yes! I would like to join a Life Group!